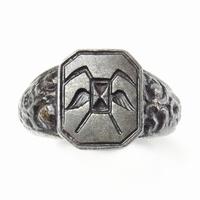 Late Medieval silver armorial seal ring with initials in mirror reversed engraving. The armorial shield shows three flowers in a vertical row, ribbon border around the initials and shield. The ring band has been restored using the original parts.